If you’re a North Sider it’s hard to imagine Chicago without Carl Sandburg Village – and even harder to imagine what Chicago’s Near North Side might be like today had it never been built. Travel back in time to the 1950s. 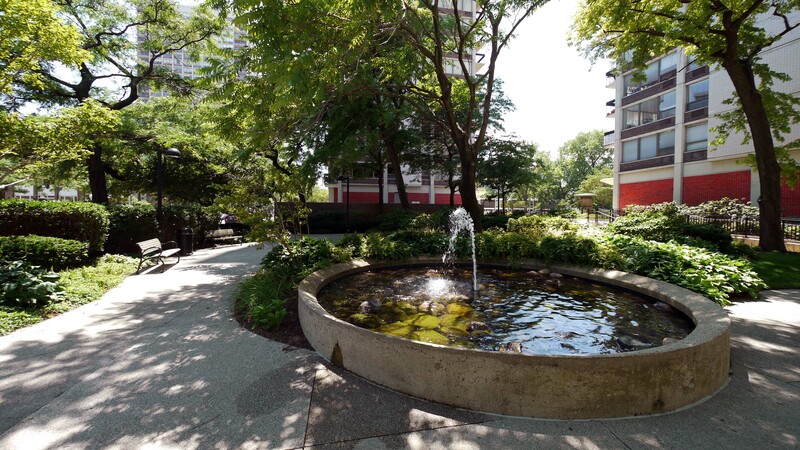 The Old Town site that would become Sandburg Village was the eastern edge of what, reported the Tribune’s Linn Allen, was an “area of blight, brothels and banditry, all pressing in on Chicago’s exclusive Gold Coast.” Just to the north, Lincoln Park was a virtual slum. To the south, the North Michigan Avenue shops worried that they’d fall victim to the encroaching urban decay that was devastating cities throughout the country. Visionary city planners, spurred by the then-North Michigan Avenue Association and larger-than-life diminutive-in-height developer Arthur Rubloff, initiated a plan for the acquisition and redevelopment of a 16-acre site bounded on the east and west by Clark St (100 W) and LaSalle St (140 W), and on the south and north by Division St (1200 N) and North Ave (1600 N). Mayor Richard M. Daley, set the redevelopment in motion by overriding the opposition of Alderman Paddy (“Chicago ain’t ready for reform”) Bauler, an early anti-gentrifier who feared the loss of his low-income voters and an influx of “silk-stockinged Republicans.” The City relocated more than 1,000 residents and demolished the existing structures. 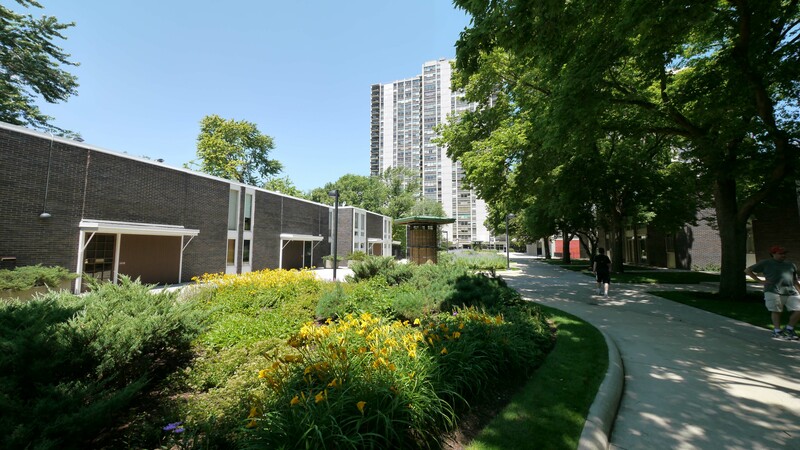 A group led by Rubloff acquired the site after hotly-contested bidding and quickly built five high-rise buildings and the Sandburg Village townhomes. Rents were projected to start at $115 a month for studio apartments, $133 for 1-bedrooms and $167 for two-bedrooms. When the project opened for occupancy, rents were higher than projected. Marketing brochures trumpeted “all-electric fully-equipped kitchens with countertops” and “easy to maintain asphalt tile floors. Many aspects of the building of Sandburg Village were – and remain – the subject of intense controversy, but few doubt the project’s success at achieving its primary goals. It stabilized the Near North Side and encouraged investment in surrounding areas. In the late 1970s the north side of Chicago experienced a condo boom, with the rapid-fire conversion of many large apartment buildings. Sandburg Village was one of the last large rental havens on the North Side. When its conversion was announced in 1979 many residents were panic-stricken, fearing that failure to buy would mean having to move away from the area. Condomania became a common term. Condomania quickly turned to condo-moania when the boom collapsed in the early 80s. At one point, it was rumored, more than 1,000 units at Sandburg Village were in some state of foreclosure. There’s been one consistent thread throughout Sandburg Village’s history: it’s provided relatively affordable in an attractive environment close to the heart of the city. Sandburg Village consists of 2,610 units in seven separate condominium associations which are members of a master association, the Carl Sandburg Village Homeowners Association. Sandburg Village, and the individual condo associations, are all named after American writers. 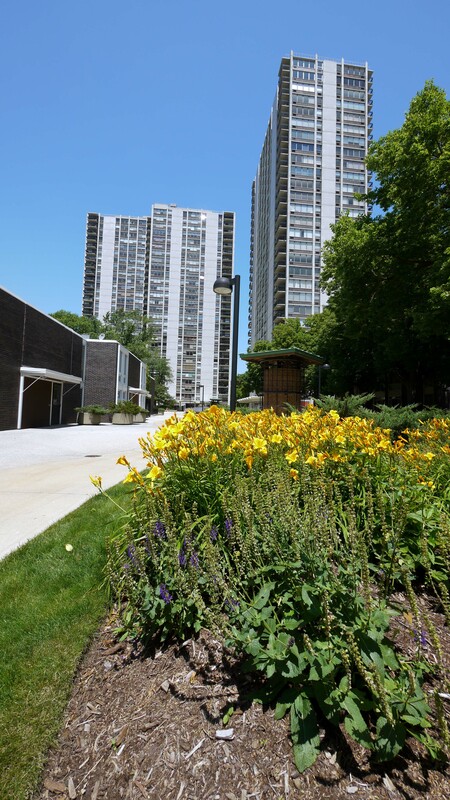 The master association is responsible for maintenance of the common areas of Sandburg Village – landscaping, snow removal, security, signage, the swimming pools, tennis courts and other amenities shared by all residents. The master HOA also sets rules and regulations governing acceptable use of the common areas. Leash your dog. Don’t feed the pigeons. Don’t pick the flowers, etc. The master HOA is supported by levies against the individual condominium associations which then apportion the costs among the individual unit owners. 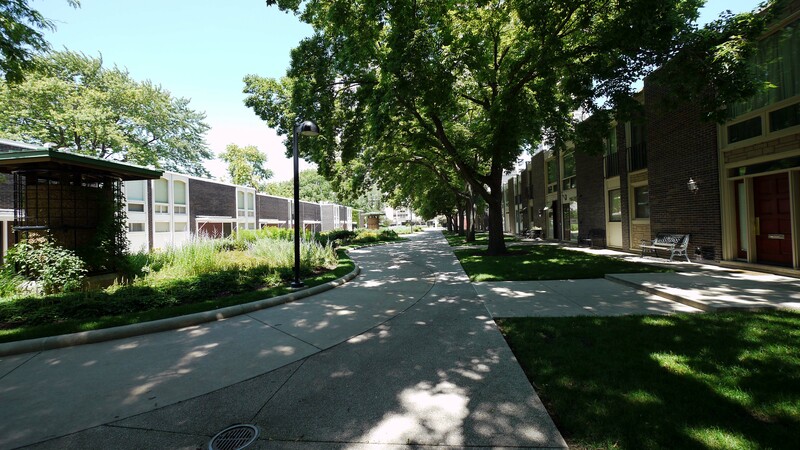 Passersby, who see only Sandburg Village’s exterior, might think of it as a dense concrete jungle. It’s not. In keeping with the original plans, the majority of the site is open space focused on a landscaped north – south concourse – a village center – with benches and interior shops and offices. 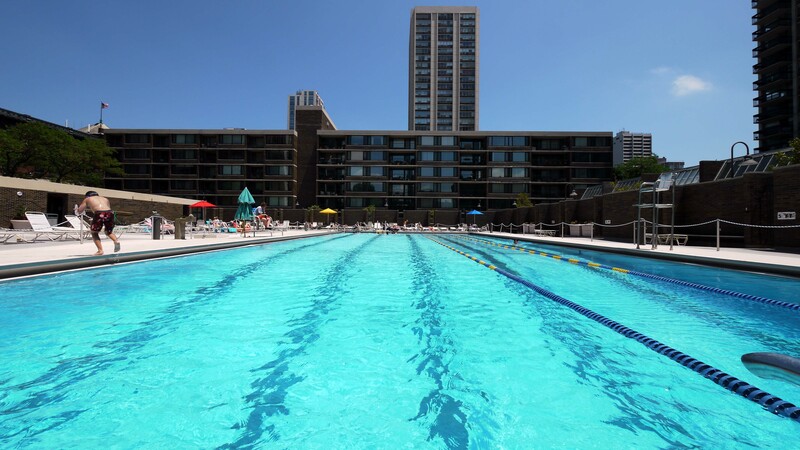 Sandburg Village has two large outdoor swimming pools, one in the 1200 block at the south end of the complex, and one in the 1500 block. The 9-foot deep pools have attendants, locker rooms, cabanas and a refreshment area. A separate fee is charged for pool membership during the 4-month season. Hospitality rooms in the Eliot and Alcott condominiums accommodate up to 50 or 100 guests, respectively, and are available for a modest rental fee. Sandburg Village also has four tennis courts and a tot lot. Commercial spaces at Sandburg Village host a dry cleaners, doctor and dentist offices, a hair salon, child care facilities and a real estate office. Parking. Rental spaces are available in a heated underground garage. Street parking in the area is difficult, at best. Pets. Pet policies vary by building. Most of Sandburg Village is pet-friendly, but several of the high-rises maintain strict no-pet policies, providing an alternative for residents who might have allergies. Shopping. The busy Potash Market at 1525 N Clark St, known to everyone as the Sandburg Supermart, was once reported to be the highest-grossing grocery in the US on a per square foot basis. A full-service 24-hour Jewel Food Store, with a parking lot, is located just North of Division at the southern tip of Sandburg Village. Many prefer the Dominick’s, a few blocks to the west. Transportation. Residents of Sandburg Village have easy access to multiple bus routes along both Clark and LaSalle. A CTA Red line stop is at the southern end of the development, at Clark and Division. Expressway access from Sandburg can be time-consuming. The complex does have easy access to Lake Shore Drive. Parks, recreation. In addition to the on-site amenities, residents enjoy close proximity to Lincoln Park, North Avenue Beach and Oak Street Beach. The master association is managed by Draper and Kramer. Individual associations retain separate management. There are eight high-rise buildings at Sandburg Village, a mid-rise building and 60 townhomes and artists’ lofts. The development was first occupied In 1963 and completed in 1971. Cummings and Dickinson Houses, 1360 N Sandburg and 1355 N Sandburg. The 28-story buildings were completed in 1963 and contain a total of 567 units. 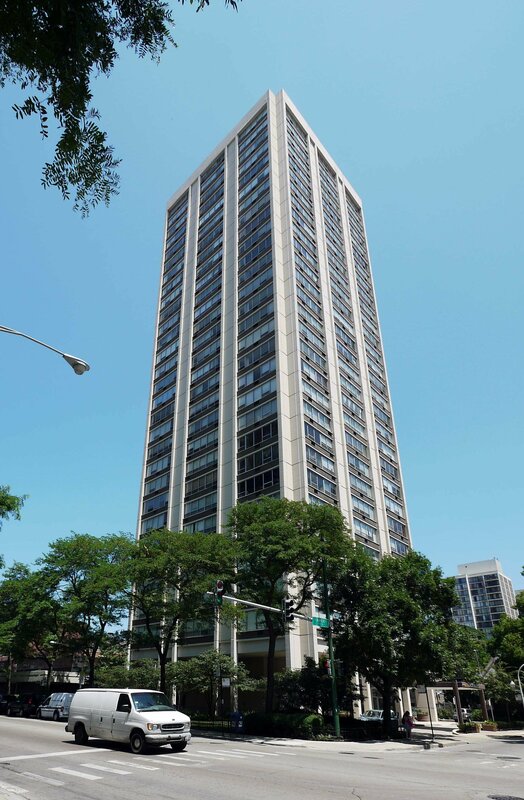 Alcott and Bryant Houses, 1460 and 1455 N Sandburg are virtual twins of Cummings and Dickinson – 28-story buildings completed in 1963 housing a total of 567 units. Town Houses. 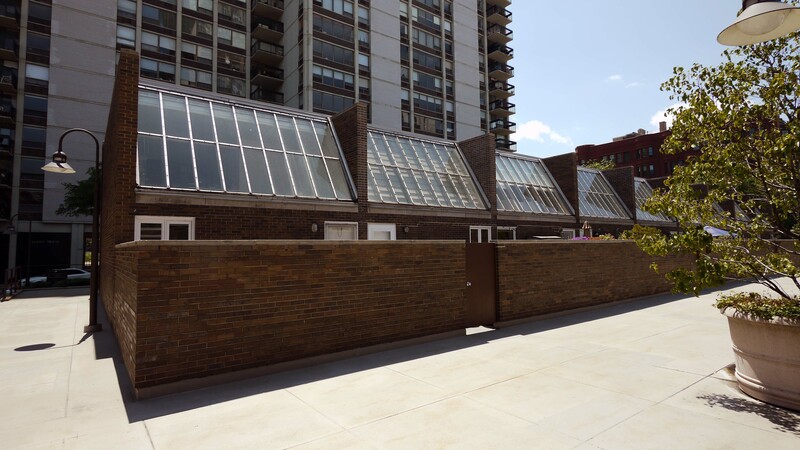 The 60 townhomes at Sandburg Village, completed in 1963, come in two very distinct styles: traditional 2-story townhomes, some with basements, and one-bedroom duplex artists’ lofts with sloping glass skylights illuminating a studio area. Eliot House, 1255 N Sandburg, houses 324 units in a 28-story tower completed in 1963. 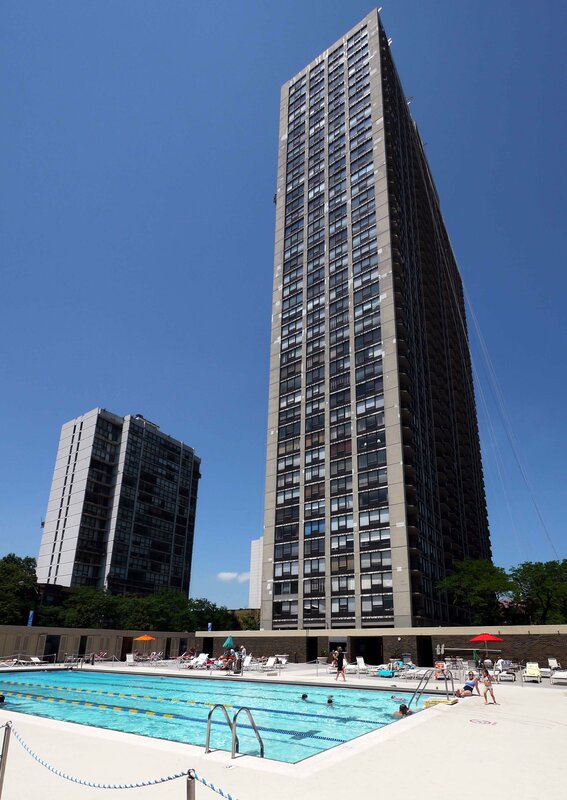 Faulkner House, 70 W Burton Pl, is a 30-story tower with 224 units, completed in 1967. Faulkner and Lowell Houses, unlike the other Sandburg Village high-rises, have no-pet policies. Both buildings are along the east side of Clark St, across from the main complex. Lowell House, 88 W Schiller St, houses 252 units in its 29 stories. It was completed in 1969. James and Kilmer Houses, 616 units. At 43 stories the 520-unit James House, 1560 N Sandburg, is the tallest of the Sandburg high-rises, the furthest north, and also the newest, completed along with Kilmer House in 1971. Kilmer House, 1555 N Sandburg, is a 6-story midrise with 96 units. Units at Joyce and Kilmer typicall command higher prices than units in the other, older Sandburg buildings. Many of the units have been upgraded over time, and many have been combined into larger units. The mix includes studios, one-, two-, three-bedroom and larger units, 1-bedroom artists’ lofts and large townhomes. Many of the units have balconies. Views from most of the complex, especially units facing south and east, are excellent. Units currently on the market include studios priced from the $120s, 1-bedrooms from the high $140s, 2-bedroom, 2-bath units from the high $240s and 3-bedrooms from the low $400s, and townhomes from the mid-$700s. Prices vary considerably based on upgrades, floor, building and exposure. If you’ve lived at or visited Sandburg Village, add your thoughts in a comment. Comments are moderated, and commercial messages are not allowed. 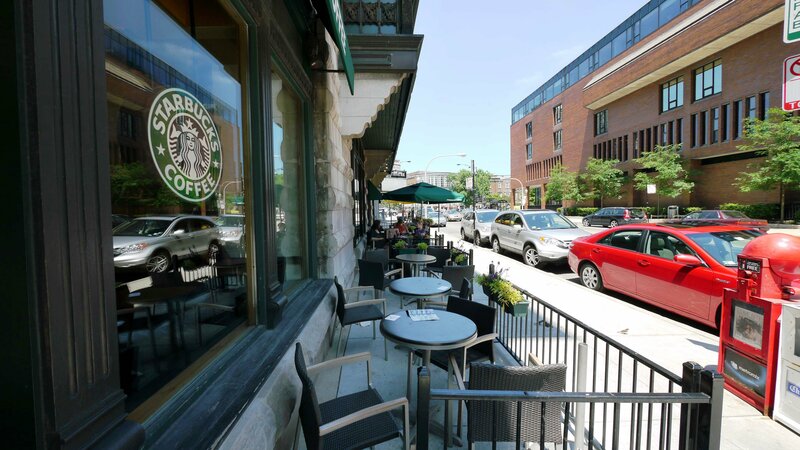 Andersonville and Uptown – hot or not?